Finally! I have a picture of my adopted tree. This is my little gift for orangutans. Maybe some years from now, they'll be able to enjoy its fruit. Cempedak is one of my favorite fruits. It's like jackfruit, but more fragrant and tastier, at least to yours truly. You can adopt a tree via yayorin.org. 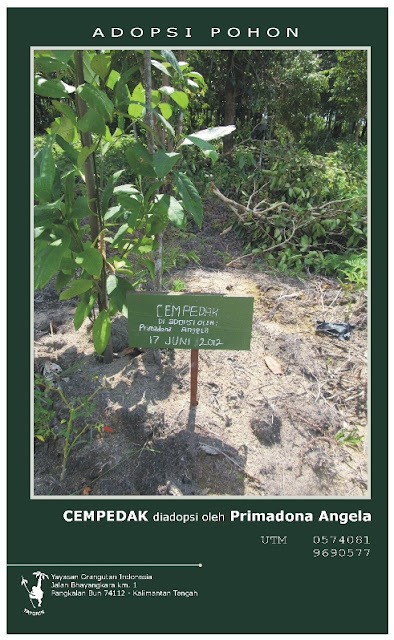 Adopt a tree today, to preserve the forests and orangutans' habitat! You can even adopt a tree for your loved ones, as a gift. One day, I hope I'll be able to visit the tree. Maybe I'll adopt more trees in the future. What kind of trees that you'd like to adopt?